Professional teeth cleaning pays steady dividends over time. A healthy mouth can last a lifetime with proper care! Simple dental cleanings on a regular basis boosts your overall health to another level. Daily habits of brushing thoroughly and cleaning between the teeth with floss or small brushes can help you avoid tooth decay and periodontal diseases. Most people know that a tooth with severe decay can result in tooth loss if not treated. But for adults, one of the causes of a tooth being lost is periodontal disease. Periodontal disease is an infection of the gum tissue caused by bacteria. Oral cancer is the sixth most common cancer in men and the 14th most common in women. The Oral Cancer Foundation reports that in the past year around 30,000 people were diagnosed with oral cancer in the USA. Only half of those diagnosed will survive more than five years. When oral cancer is detected early, there is an 80% to 90% chance of survival. When you visit our Sedona dental office for checkups, we examine your oral cavity for visible signs of cancer. We recommend that you see your dentist at least once a year for this oral cancer screening. To schedule a teeth cleaning call 928-282-3246 today! 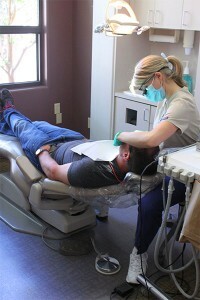 Sedona Dentist Roy Daniels takes great pride in our state of the art equipment and unparalleled hygienists. Our hygienists will not only show you the proper way to take care of your teeth. You can expect a comfortable thorough teeth cleaning that reaches all of those areas you simply cannot reach at home. Unfortunately many of the most serious oral diseases, often painless, cannot be seen or even felt until they have progressed into much later stages. At this point much of the damage is irreversible. Many of our dental patients from Sedona, Cottonwood, Cornville, Clarkdale and Camp Verde appreciate our trained eyes that search for any signs of disease or precursors for further problems. When we clean your teeth we also check for cavities, fractured teeth, recurrent decay under existing crowns, and oral cancer. The least important thing we did for you today was clean your teeth.